Water is a necessary resource for houses, businesses and farms, but they may be located in areas where water resources are not readily available. In order to get the water resource to a usable method of output, a well will need to be drilled, bored, or dug into the underground aquifers. 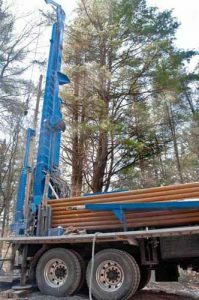 Since drilling, boring or digging a well can be a technical job, a Water Well Driller or Water Well Contractor would be hired to survey the property and choose the best location for the well, the depth of the well, well yield, and other considerations such as the elements under the ground surface including clay and bedrock. Additional considerations to be taken into account include ensuring the quality of the water and the conditions that may affect it. Water well contractors and drillers would look at factors such as the proximity of methane gas, barnyard runoff, previous use of pesticides and fertilizers, nearby septic systems, old wells or dumpsites, and other factors that can be seen or unseen. All of these factors can contaminate underground water and lead to undrinkable water or plugging of the well. Water well drillers and contractors in Georgia are required to have a license to drill, bore or dig into the ground. They must pass a series of exams to prove that they have a good working knowledge of well drilling and are capable of performing the services as well meet the standards of the Georgia Water Well Standards Act of 1985. The Act not only defines drilling standards but also includes a license and performance bond requirement. Water well drillers and contractors have a $30,000 performance bond requirement. If you are a Georgia Water Well Driller, contact the Surety Bond Specialists at SuretyGroup.com for a free quote that fits your specific situation. Water well contractors can go a step further and obtain a MGWC certification otherwise known as a Master Groundwater Contractor which requires an additional certification and general exam. This certification is the highest level a contractor can achieve. Ensure that your water is drinkable and safe, and hire a highly trained licensed driller or contractor. The State of Georgia provides an online list of licensed water well contractors that can be found on the Environmental Protection Division website. Where can I take the exams for a drillers licence?Also is there a different test for shallow Wells?